Even though Diamond Crevasse was the ED for most of the first half of the series, I didn’t really listen to it until hearing the version performed after the episode where [spoiler]Michel dies[/spoiler]. I think at that point was where I started looking more and more into May’n as an artist. I just had to hear more of her and check out her performances. As I stumbled across more of her songs and videos, I was definitely blown away by what I heard and saw. Her voice is beautiful and has so much power and feeling behind it. Even in that video of her first live, it just touched me and I was like that lady crying at around 2 or so minutes into the song lol. I love her upbeat songs, but I am definitely more fond of her ballads. As this was still at a time before what I’m now calling “the purge,” in addition to obtaining the vocal songs from the Macross F series, I started checking out her albums and live concerts. What can I say? I was hooked. If I was in Japan, I’d probably be one of those dudes out there waving the glowstick around, honestly. In watching the more recent concerts, she really has come a long way as an artist, performing at a sold out Budokan on multiple occasions. When I heard she was going to come through to Anime Expo in 2011, I was really really tempted to go check it out, but that was during a time where my finances and my current situation in life really didn’t allow me to get away. However, when I the news came through that she was going to be returning to the States in 2012 for her Rock Your Beats tour, I hawked the promotional website on the daily. I didn’t wanna miss it. After staring at the website for my local show for a good 2 or 3 weeks, I finally went ahead and bought a pair of tickets for my daughter and I. 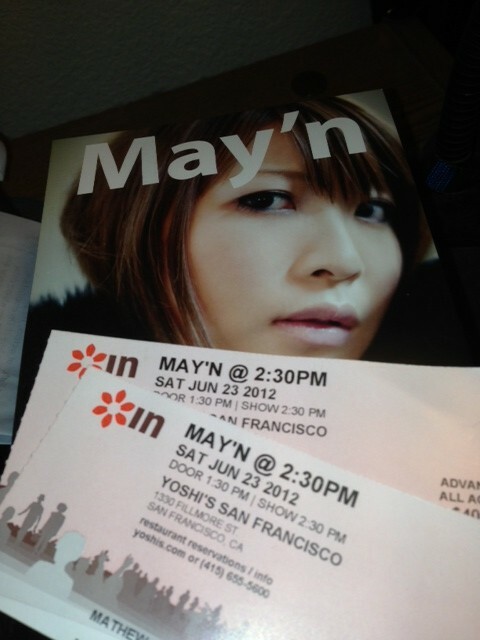 The show took place at Yoshi’s in SF, which is a somewhat small venue, but is definitely more intimate because of the setting. I remember checking out a McKnight performance a while back at another Yoshi’s and it was just awesome. Once we both arrived at the location, we could already see the line along the street, including some Sheryl cosplayers. Once we got in and found some seats, I eagerly waited for the show to start. I honored the rules regarding photos and filming, even though there seemed to be so many people around me ignoring that rule. I wish I did at least snap a quick pic of the performance on my phone. I stumbled across one site that covered the event, although I wish they snapped more photos. It was definitely a very unique experience. I think her upbeat songs really were limited by the size of the venue since they couldn’t fit the full ensemble, but it still came out okay. The whole middle section was pretty much an open floor where people stood and got their glow stick action going on. She performed a variety of songs from both her albums and from the various anime where she had been featured. She did an interesting rendition of Diamond Crevasse which was somewhat acoustic, although a lot of the details of that is lost in the cobwebs now since I’m writing this post up almost 4 months later (bad, bad, bad… >_<). I never get tired of her singing that song, but I still think I like her first live performance of it along with the one she did on her Big Waaaaave tour. I kinda wish she performed some others which I had grown fond of, but even still, I enjoyed her set list. I’m kinda glad I became familiar with Japanese music concert traditions with regards to encores, otherwise I probably would’ve nearly bolted out of there once she was supposedly done. The audience chanted for an encore, and they most certainly obliged. Throughout the concert, she would occasionally break to speak and interact with the audience. Her English is pretty good, but there was a part at the end where she wished to express her gratitude without dealing with that barrier, so she spoke in Japanese. To my surprise I understood the gist of most of what she was saying, and relayed it to my daughter the best that I could. At the end, she referred to us as “buin” with her as the “buchou,” and pretty much went down each row in the audience making eye contact, giving a wave, and saying “thank you/arigatou” to each and everyone of us individually from the stage. She was very amiable and the whole experience felt personal and intimate. I kinda wish I spent the extra on the VIP and brought a bit more cash for concert swag, but since my daughter wanted to go, I decided not to as 2 VIP tickets would be quite painful on the pockets. At the end of the concert, she promised that she would be returning, and I definitely look forward to it if/when she does. … Yeah, I could probably go on and on. Wow! Thanks for the fantastic article! I’m glad to find a fellow May’n fan. I had to give away my ticket for her concert at Yoshi’s because flight tickets were too expensive from here (Hawaii) to San Francisco at that time of the year. Fortunately I was able to attend her kickoff performance of this concert tour at Kawasaki, Kanagawa, Japan, and so I shouldn’t complain. I got to know May’n’s songs while I was following Yoko Kanno’s music. I was thunderstruck by the video of her Northern-Cross performance at Animelo Summer Live 2008. At that time, I didn’t even know it’s an anime song. I didn’t even know that anime songs are something you listen to away from the animes themselves. I wasn’t interested in animes at all. 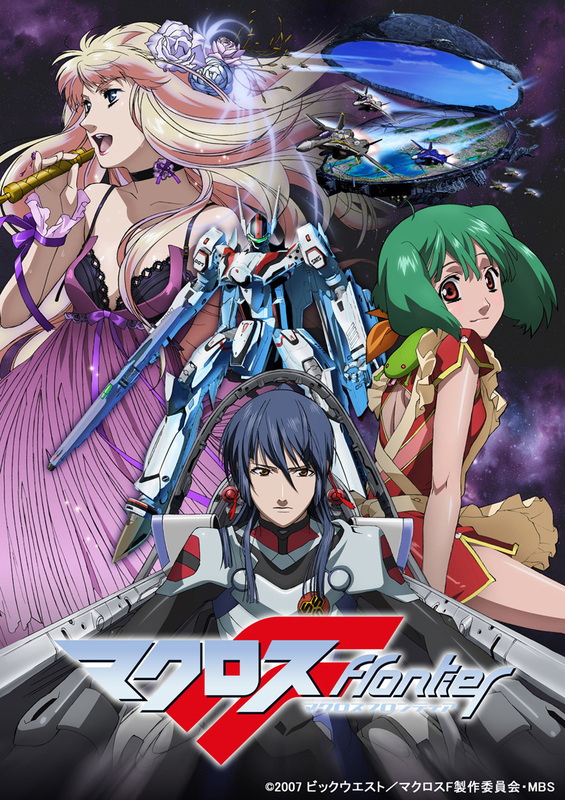 But, I had already been an avid May’n fan when I started to watch (restrospectively) Macross Frontier. I’m still not much interested in animes but I lately listen to a lot of anime songs, including Megumi Nakajima’s. For me, anime is the medium where I discover a lot of great Japanese artists and I’m grateful that they have that platform. Not knowing the language (still learning) and not having any real good local channel offerings on cable, that’s pretty much all I have. The cool thing is that the music you hear on those shows nowadays aren’t really what I’d call “anime music.” Yeah, sometimes there’s songs made specifically for those shows with the seiyuu singing and such. However, often times it’s real music artists who just get featured within the shows (usually the OPs and EDs). It’s a powerful platform, and I’m sure many were able to use it as a means to boost their popularity/exposure and maybe even launch/catapult some music careers. To go off of what you were saying, I believe Yoko Kanno has a great ability with regards to her compositions. That even though she made those songs specifically for those shows, she just has the ability to make those songs transcend the anime. I actually first discovered Kanno when she did the music for Macross Plus. If you haven’t checked out the songs from that series, you definitely should. One of my favorites from that was “After, in the Dark/Torch Song”. Lucky that you got to catch that concert in JP though. I’m sure it was such a larger experience than you would have in San Francisco. Thank you for your response! I agree with what you say about anime music, at least on the basis of my limited experience. I know tons of tunes by Yoko Kanno (and yes, I love Macross-Plus tunes, including the one you recommend) and I listen to some anime/game-related songs by singers including May’n, Maaya Sakamoto, Megumi Nakajima, KOTOKO, and Savage Genius. I listen to a bit of J-POP songs, too. Since my experience in this field is this much limited (my main field is classical music and jazz), I’m not sure how accurate my perception is, but as far as I know, anime music tends to be more creative, bolder, and more varied. The complexity of Kanno’s music is sometimes too much for general listeners, it seems. I heard a May’n fan complaining about the complexity of “The Forbidden Elixir”, for example. To me, that’s the song that most extracts May’n’s best qualities and abilities. Each time I listen to it, I’m amazed at the creativity that went into the song, and how such complexity can be put into a single song and how May’n brings out such complex emotions. Her stage performance adds to the music. It’s utterly mesmerizing. Not to such a degree as Kanno, but other composers also tend to produce bold songs for anime. It’s as if the composers relish the challenge and unleash their creativity for anime songs. Anime seems to be a platform that allows that. In contrast, general J-POP is more benign and tend to be boring to me.